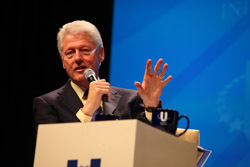 Former President Bill Clinton speaks during a previous Clinton Global Initiative University conference. Click here to learn more about applying to the Clinton Global Initiative University conference. 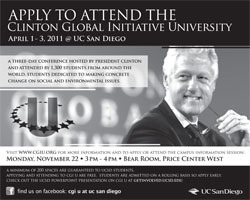 Applications are now available for the 2011 annual meeting of the Clinton Global Initiative University (CGI U) on April 1-3 at UC San Diego. President Bill Clinton founded CGI U to empower undergraduate and graduate students to create tangible solutions to pressing global challenges. The 2011 meeting will convene more than 1,000 students, non-profit leaders, and social entrepreneurs for panel discussions and workshops focused on effective strategies for creating positive change. Past attendees have included Lance Armstrong, U.S. Surgeon General Regina Benjamin, Matthew McConaughey, Kalpen Modi, Brad Pitt, Pharrell, John Podesta, and Natalie Portman. The conference is free to attend, but students must apply, and in their applications propose a Commitment to Action – a concrete plan to address a global challenge within one of CGI U's focus areas: education, energy & climate change, global health, human rights & peace, and poverty alleviation. The early decision application deadline is Nov. 30, and the final deadline is Feb. 7. Some funding is available to cover travel expenses for qualified students who apply by Nov. 30. "Through the Clinton Global Initiative University, students and universities have made more than 3,000 commitments over the last three years," President Clinton said. "Commitments made in 2010 alone will improve the lives of more than 290,000 people, and I am looking forward to joining next year's attendees at the University of California, San Diego in April to see the progress being made." The Clinton Global Initiative University (CGI U) challenges college students and universities to address global problems with practical, innovative solutions. At the CGI U meeting, young people and universities do more than simply discuss the world's challenges – they take concrete steps toward solving them. To learn more, visit CGIU.org. Established in 2005 by President Bill Clinton, the Clinton Global Initiative (CGI) convenes global leaders to devise and implement innovative solutions to some of the world's most pressing challenges. Since 2005, CGI Annual Meetings have brought together nearly 150 current and former heads of state, 15 Nobel Peace Prize laureates, hundreds of leading CEOs, heads of foundations, major philanthropists, directors of the most effective nongovernmental organizations, and prominent members of the media. These CGI members have made more than 1,900 commitments, which have already improved the lives of nearly 300 million people in more than 170 countries. When fully funded and implemented, these commitments will be valued at $63 billion. The CGI community also includes CGI University (CGI U), a forum to engage college students in global citizenship, MyCommitment.org, an online portal where anybody can make a Commitment to Action, and CGI Lead, which engages a select group of young CGI members for leadership development. For more information, visit www.clintonglobalinitiative.org.